We are officially one week away from our state writing test. Nerves are kicking in and some are weary. When motivation seems to be dropping, this is usually an indication that a classroom transformation is in order. 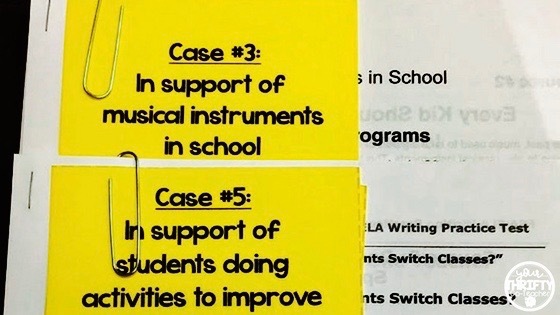 Just walking into a "new room" is enough to get students motivated to work their hardest. 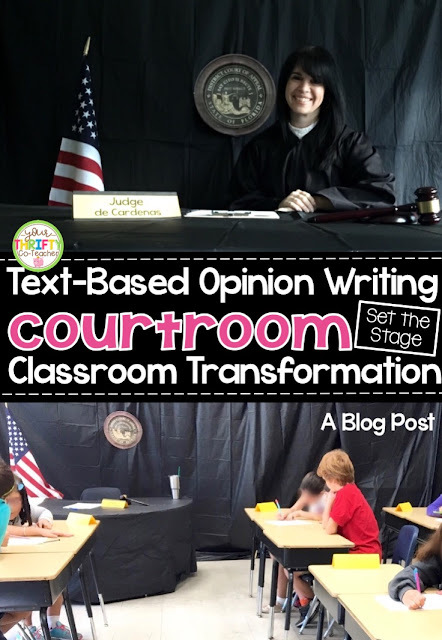 This time around, I created a courtroom experience for my students where they were able to apply skills they've learned about text-based opinion writing in order to develop a focused and well supported paragraph. Setting the stage for a classroom transformation begins with a costume of course. I mean, isn't being able to take on a roll and play a character half of the fun? 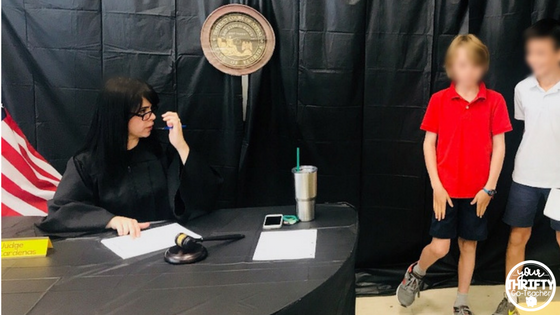 Today, the Honorable Judge de Cardenas showed up to the courtroom. The two essential items I needed were purchased online through Amazon: a robe (more like ... a graduation gown) and a gavel. I will include an Amazon Affiliate link below that you can click on in case you are interested in checking out the ones I purchased. 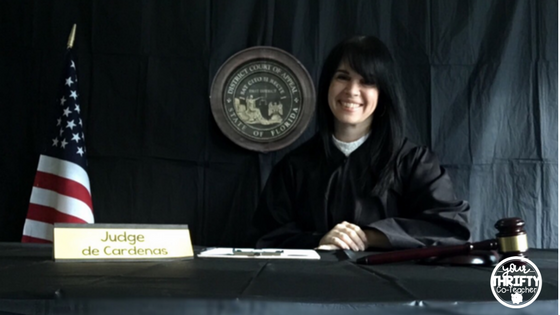 The background of the judge's bench was turned into a black background with the black table clothes, and the kidney-shaped table was covered with them as well. 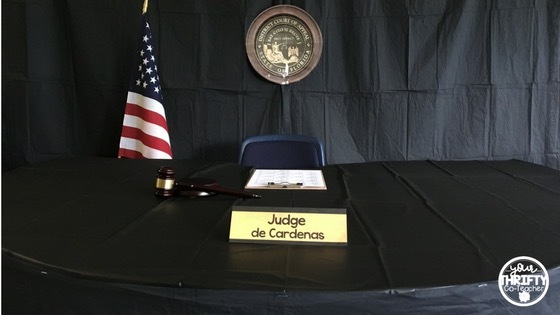 I then taped and stapled the laminated court seal onto the tablecloth in the background and placed the printed desk name plate on the table. Lastly, I added our classroom's American Flag and a gavel to the table, and the stage was set! 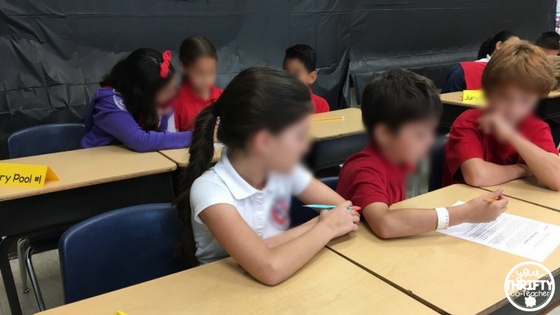 Once the main area was set, I organized the students' desks into groups of three to allow for manageable collaborative groups. 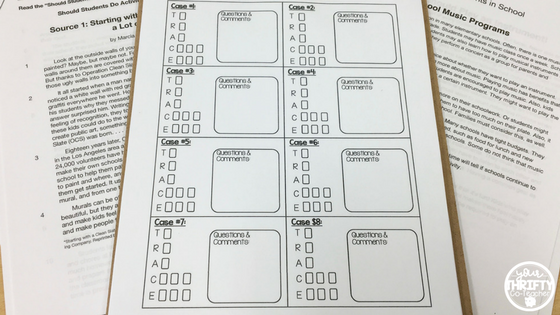 Then, I placed "Jury Pool" numbers at each group to help me sort students into groups and easily assign prompts and articles. they were to take (in support of or against a certain topic). jury pool card with a number on it. They had to find the matching desk plate and sit in that group. 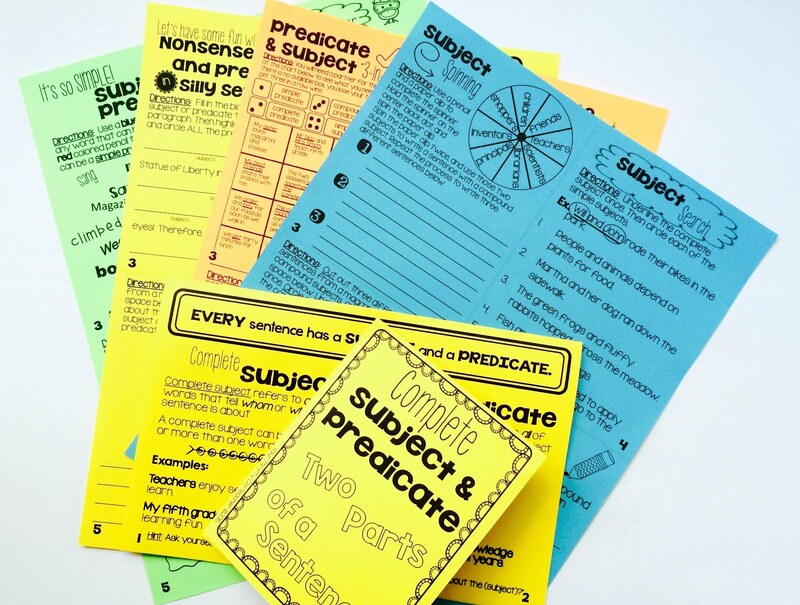 They were required to read the text set together and look for pros and cons for the prompt. supporting the prompt or take the stand against it. group wrote about being agains school uniforms. 30-35 minutes to accomplish this task. in preparation for the presentations. 6. 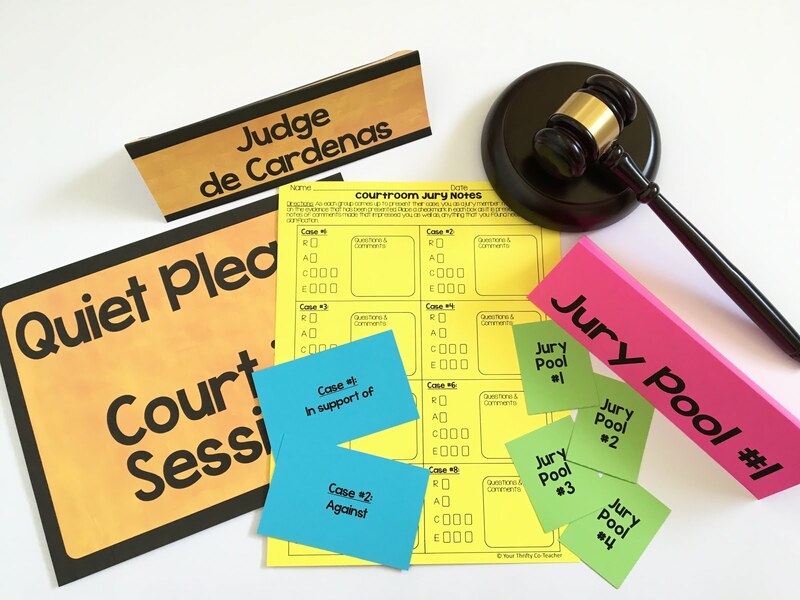 Jury Pools were called up one at a time. 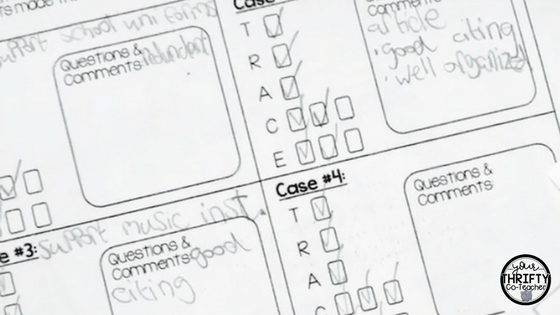 They were asked to state their case for the jurors, and read their paragraphs to the other jurors. 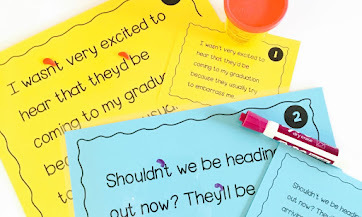 This classroom transformation took about 15 minutes to prep using the Text-based Writing Opinion Resource found in my Teachers Pay Teachers store (you can find it by clicking HERE), and less than 40 minutes to set up. That's it! 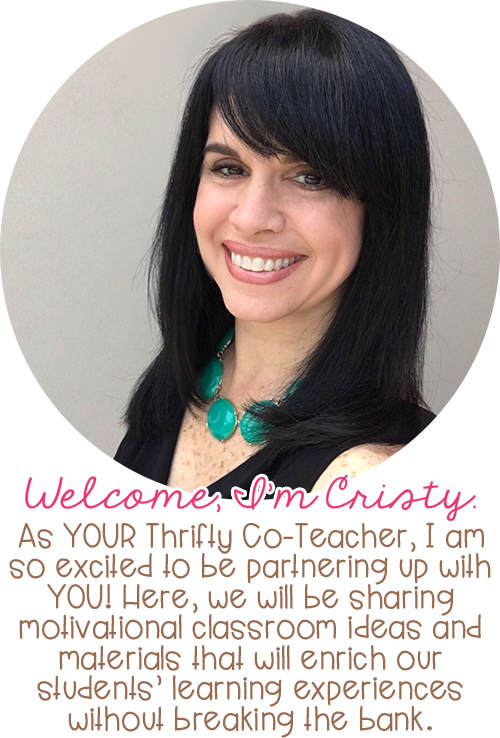 I hope this post encourages to try a classroom transformation in your ELA class, or any class for that matter. If you need any further clarification on this lesson, please feel free to ask them below, and I will do my best to answer them. Remember to click on the "Set the Stage" button for other ideas on how you can transform your classroom and engage your own students. Happy teaching!